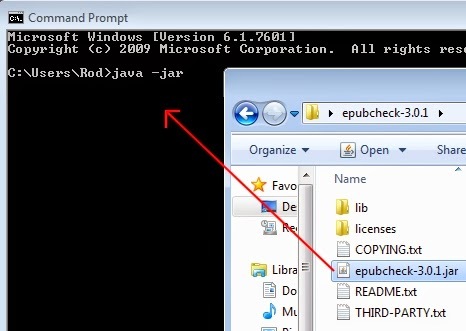 The important file is the one called epubcheck-3.0.1.jar, which, unfortunately, is a java program. To run it, you will need the latest version of the java runtime environment installed on your computer. This can also be confusing, but the simplest way to get java would be to go to this website: http://java.com/en/download/installed.jsp from where you can check whether you have the latest version on your computer and download/update it. But you are not yet done. Epubcheck, like kindlegen is a command-line program, and to use it you will need to find and run the command prompt interface (Windows) or the Terminal (Mac). This is inconvenient, and will take many of us out of our comfort zone, but is unfortunately unavoidable. 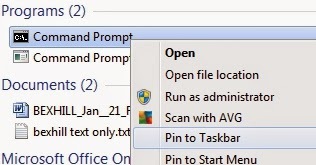 Whether it is an alias or on the taskbar, or even directly in the start menu, just double-click the icon to launch it. I will cover how to use the terminal to run epubcheck on a Mac at the end of this post. No errors of warnings detected. The C:\ prompt returns once the program has completed. You can use the up and down arrow keys to cycle through commands you have issued, which could come in very handy if you end up testing the same file over and over again! Hit return and a file called output.txt will be created on the desktop containing the output from epubcheck. (You can substitute any other filename you want.) It is a good discipline to routinely save each set of error messages in separate files for reference. Bear in mind, though, that nothing whatever will be displayed in the window whilst the program is executing, because the output is being diverted to the file you specified. The only indication you will have that the program has completed and your output is ready to look at will be when the command prompt returns. In my case, the epub file I used was an epub 2.0 e-book and epubcheck detected this (the version number is embedded in the e-book in the opening <package …> tag in content.opf) and validated it against the appropriate specification. 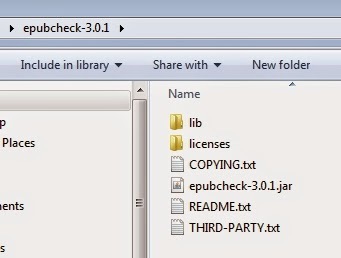 Epubcheck 3.0.1 will be able to validate epub 2.0 or epub 3.0 e-books. Errors like this are a bugger, because there may well be knock-on consequences of changing the filename. Sigil may well take care of them for you, like updating content.opf, but you would be well advised to check that things like links in the html table of contents etc. are also updated. Heaven help you if you have an index!!!! Find and replace may well come to your rescue!! Once the error has been put right, you will need to run epubcheck again, correct any errors which are still there or indeed any new ones which your ‘correction’ might have generated (!) and then run epubcheck again until all errors have been eliminated. And then you have a finished e-pub!! Firstly, download epubcheck and save the folder to the desktop, as outlined above for Windows. And also check you have the current version of the java runtime environment installed. The Terminal is the command-line interface on the Mac, and is directly analogous to the command prompt on a Windows computer. In fact, the Terminal betrays the fact that OsX is essentially a kind of linux environment. Most of the commands you can issue via the terminal are the same as in linux. You can get a handy guide to using the terminal interface here: http://guides.macrumors.com/Terminal. As I said about the Windows command prompt, be careful what you type in here, be sure you know what you are doing! Fortunately, running epubcheck is a simple matter! To get to the terminal, locate it in the utilities folder inside the applications folder and drag it to the dock from where you can access it more easily. Or indeed make an alias and put it on the desktop. If for some reason you did not get a space, you would need to type one, as shown in the Windows example. Each component of the instruction needs to be separated from the others by a single space. Hit return to run epubcheck and you will get the results. In this case, the outcome was the same as for the Windows example. To get a copy of the error messages, your life is made easier on a Mac, as you can click and drag to select the messages, copy to the clipboard and then paste them into a blank MS Word file. Alternatively there is a handy reference here: www.maclife.com/article/columns/terminal_101_piping_output on how to direct the output from the Terminal to a file. In essence, this says to add: > fiename.txt after the command to write the output to the file: filename.txt instead of the screen. (note the space before and after ‘>’ compared with just a space before in Windows). Next Steps: Now your e-pub is complete and passes epubcheck you can send it off to resellers such as Apple or Kobo or your wholesaler or upload it to your website for download. I have already covered the necessary steps you need to take to convert your e-pub to kindle. My next post will link to these posts and cover how to download and run kindlegen to make your kindle e-book.